Based on the award-winning article in Harvard Business Review, from global leadership expert John Kotter. It's a familiar scene in organizations today: a new competitive threat or a big opportunity emerges. You quickly create a strategic initiative in response and appoint your best people to make change happen. And it does-but not fast enough. Or effectively enough. Real value gets lost and, ultimately, things drift back to the default status. Why is this scenario so frequently repeated in industries and organizations across the world? 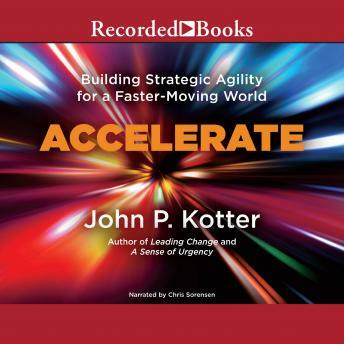 In the groundbreaking new book Accelerate (XLR8), leadership and change management expert, and best-selling author, John Kotter provides a fascinating answer-and a powerful new framework for competing and winning in a world of constant turbulence and disruption. Kotter explains how traditional organizational hierarchies evolved to meet the daily demands of running an enterprise. For most companies, the hierarchy is the singular operating system at the heart of the firm. But the reality is, this system simply is not built for an environment where change has become the norm. Kotter advocates a new system-a second, more agile, network-like structure that operates in concert with the hierarchy to create what he calls a "dual operating system"-one that allows companies to capitalize on rapid-fire strategic challenges and still make their numbers. Accelerate (XLR8) vividly illustrates the five core principles underlying the new network system, the eight Accelerators that drive it, and how leaders must create urgency in others through role modeling. And perhaps most crucial, the book reveals how the best companies focus and align their people's energy and urgency around what Kotter calls the big opportunity. If you're a pioneer, a leader who knows that bold change is necessary to survive and thrive in an ever-changing world, this book will help you accelerate into a better, more profitable future.